$499 DOWN Guaranteed Approval!!! This Lincoln includes: ENGINE: 3.7L TI-VCT V6 (STD) V6 Cylinder Engine Gasoline Fuel STANDARD PAINT LIGHT DUNE, PREMIUM PERFORATED LEATHER-TRIMMED BUCKET SEATS Cooled Front Seat(s) Seat Memory Power Driver Seat Heated Front Seat(s) Leather Seats Driver Adjustable Lumbar Bucket Seats TIRES: 20" Tires - Front Performance Tires - Rear Performance SHADOW BLACK TRANSMISSION: 6-SPEED SELECTSHIFT AUTOMATIC Transmission w/Dual Shift Mode A/T 6-Speed A/T *Note - For third party subscriptions or services, please contact the dealer for more information. * Clean interior? How about flawless. 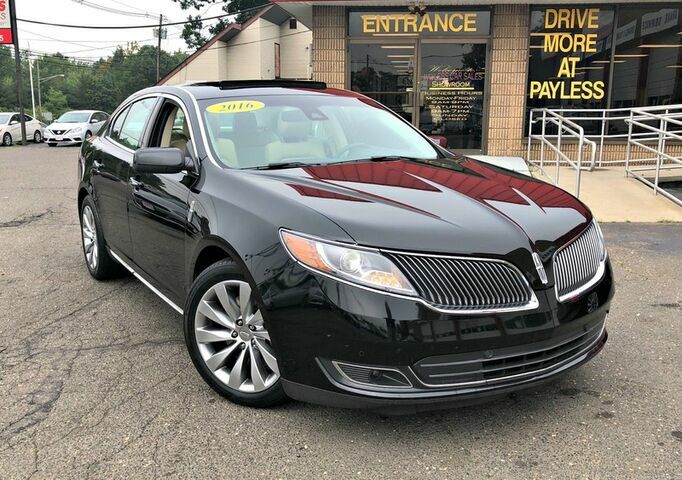 This Ceritified Pre-Owned Lincoln MKS looks like has never been used. Well-equipped, well-cared for and still covered under the manufacter's factory warranty. Added comfort with contemporary style is the leather interior to heighten the quality and craftsmanship for the Lincoln MKS The handling and stopping power of this Lincoln MKS is enhanced by the recently replaced tires. More information about the 2016 Lincoln MKS: The 2016 Lincoln MKS is a full-size luxury sedan that appeals to those who want an extremely well-equipped, comfort-oriented and technology-loaded sedan. With its continuously damping suspension and Drive Control interface--plus a host of active safety features--it sets its sights on the tech prowess of top German sport sedans if not quite in all-out performance, in features and interior appointments. Considering all the phenomenal tech features packed into the MKS, it is priced about $10k less than comparable German sport sedans like that Audi A6, Mercedes-Benz E-Class or BMW 5-Series. Strengths of this model include extended list of luxury features, Drive Control allows driver customization of ride and handling characteristics, available all-wheel drive, plush interior, Stylish exterior, and accident avoidance technology Call now (732) 316-5555 This one won't last! Whether you have good credit, bad credit, no credit or even in a bankruptcy or repossession we can help. Our goal is 100% guaranteed approval!! Call us at 732-316-5555 or come on in to our South Amboy, New Jersey showroom and one of our credit specialists will help you get the vehicle you deserve at a payment you can afford. The advertised price does not include sales tax, title, DMV fees, finance charges, prep fee and documentation charge of $289. All financing subject to lender approval, rates and terms may vary. Any payments listed are an example and not an offer or guarantee or terms and are subject to lender assessment of credit,down payment and term. Prices subject to change at any time. While every reasonable effort is made to ensure the accuracy of this information, we are not responsible for any errors or omissions contained on these pages. Please verify any information in question with your sales representative.